The first time I read the quote above, I laughed out loud. Mr. Miller put to words my feelings about the Bible. The Bible was bland like ice-berg lettuce…I’d had it a hundred times; I knew what it has to offer. Or filler, like fiber. I knew I should have it to keep things in working order, but I resented needing it. Or as justification to imbibe in something decadent ….. because I was planning on doing things my way later. If I’d bought a pretty case to carry it in from a Christian bookstore (bonus points?) , it was nearly as good as consuming it. For some strange reason, that made me feel better about never opening it. In the past, I have considered The Bible a “salad” thing: devoid of surprises, ancient, boring. Read it. It’s good for you. It will help you grow big and strong. But when I stopped thinking I knew everything about it….I found it to be Chocolate for the Soul. A few years ago, my family presented me with the gift of a new Bible. The scriptures were written so that I could easily consume and digest them. The Message is the translation for which my craving for holiness and my short attention span decided to cooperate with one-another. 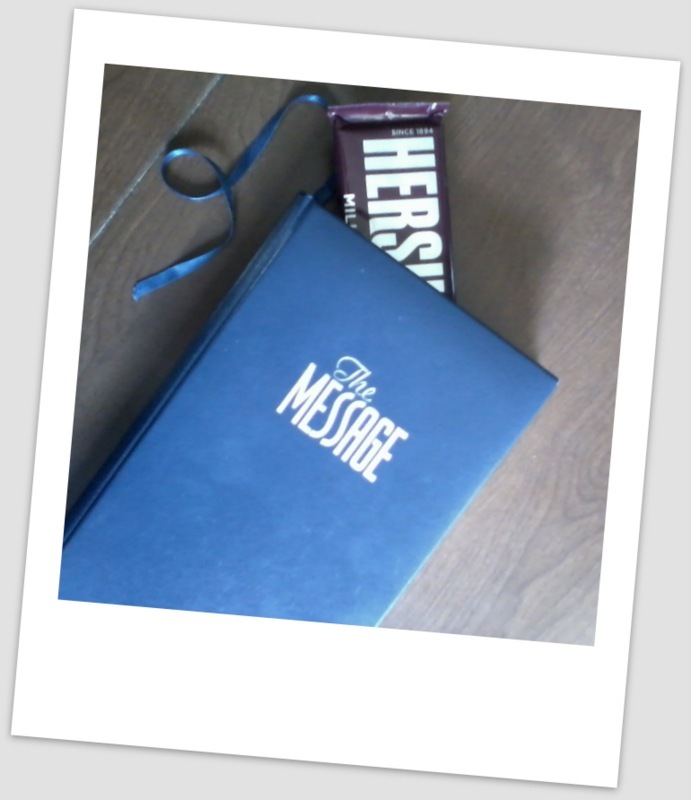 It turns out that The Good Book is indulgent, but I have to open the wrapper in order to indulge. Rich and personal, as if someone knew exactly what I would go through at different times in my life, and wrote me a letter about it. Available to savor. I have the privilege of picking it up anytime I like. Satisfying. I know of nothing else that fills the soul-space, the empty mold I’ve tried filling up with all of the things that the world believes will satisfy. It’s a treat to know what God thinks about me. It’s the sweetest thing to know He loves me with decadence. He loves me in a very non-ancient, un-dusty, and unpredictable way. Not boring in the least. I rarely crave salad, but chocolate? All the live-long day. Go ahead, unwrap it. It will help you grow big and strong….in ways you never imagined.